An excellent video discussing short selling and the changing nature of managing money. Listen to the first 30 minutes. About the only edge left is to be a longer-term investor. Buffett’s greatest insight is that monopolies, duopolies, and oligopolies face little competition and little threat of new entrants. Companies that dominate their industries represent toll roads in your daily life. Every time you do anything in your daily life, you are sending part of your paycheck to monopolists. Google now controls nearly 90% of search advertising, Facebook almost 80% of mobile social traffic. The two companies captured almost 90% of the digital advertising growth last year. An astonishing 45% of Americans get their news from Facebook. When you add Google, over 70% of Americans get their news from the two companies. Google uses universal search to dominate vertical search areas like price comparisons, and it uses its browser to further dominate the ad industry. Google is a global utility in private hands. Facebook’s Community Standards project puts the company in the position of deciding arbitrarily what speech is acceptable and what is not. Network effects effectively means monopoly. The book can help you understand how vastly the United States economy has changed over the past twenty years. If you want to invest on the side of the powerful, you seek consolidating industries, duopolies, and monopolies. However, you will also understand why inequality will keep increasing unless competition is brought back into our economy. 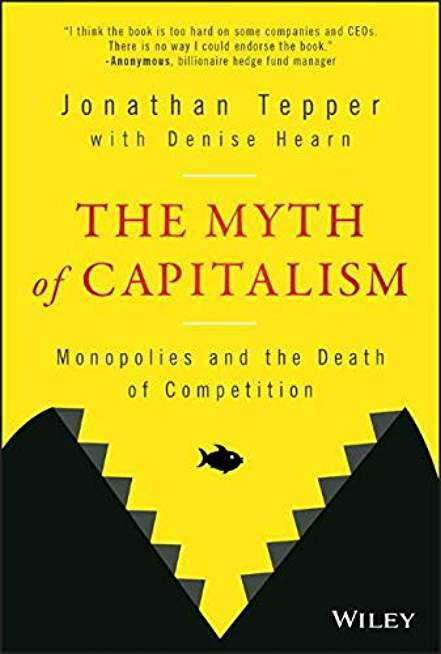 Capitalism without competition is not capitalism. 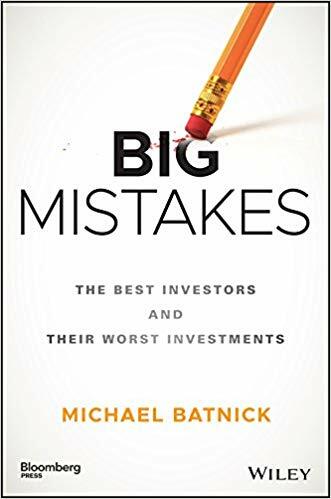 This is an important book for both investors and citizens. The authors don’t discuss other major influences on the economy like China joining the World Trade Organization or globalism, but you have a tutorial on how our economy has become hyper-concentrated. 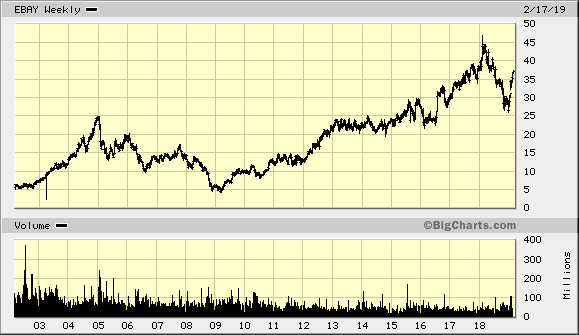 ‒ eBay as a Public Company: We review the Company’s remarkable history as well as its need for substantive change to remedy its prolonged underperformance. ‒ The Enhancing eBay Plan: We analyze the opportunities for the Company to create significant upside and detail an actionable set of initiatives to unlock trapped value, improve execution and enhance oversight. ‒ A Unique Value Opportunity: We quantify the significant value these steps will create. The most important thing successful investors have in common is worrying about what they can control. They don’t waste time worrying about which way the market will go or what the Federal Reserve will do or what inflation or interest rates will be next year. They stay within their circle of competence, however narrow that might be. If I could sum up the lesson of the above 175-page book at $35, it would be that IF you invest long-term in compounders or franchise companies that redeploy their capital at high rates of return, then expect to suffer through multiple 50% to 60% declines in stock price as you hold on for the long-term. And remember that a price decline of 50% does not necessarily indicate a bargain. 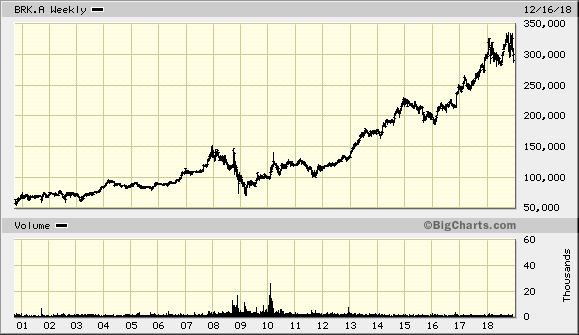 You can see the 50% sell-off in Bershire’s stock in 1999/2000 while you can barely make out the multiple 50% or more declines in AMZN over the past twenty years. Investing is HARD! You must factor in those facts with your own psychology. 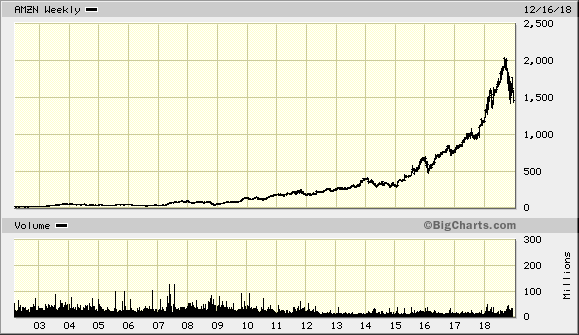 A reader asked: When do you buy gold for a portfolio? To understand the prospects for bitcoin and the other cryptocurrencies and tokens, it is necessary to grasp the centrality of gold. Gold resolved both the horizontal and vertical enigmas of money. As a universal index of value, it muted the volatile shifts and shuffles of exchange rates. As an unchanging standard, it made interest rates a reliable guide for entrepreneurs making commitments in the darkness of time. The gold standard thus provided maps and metrics that enabled entrepreneurs to act confidently across time and space. they were assured that in an ever-changing and insecure world the monetary measuring sticks would not change when they brought their products in for a landing in the marketplace. As King Midas discovered, gold (and all candidates to be real money) is not wealth itself but a metric of wealth. While some gold advocates–including George Gilder in years past–have insisted that its slow but steady 2 percent rate of growth assures an expanding supply of money. But under a gold standard, the money supply has virtually nothing to do with the gold supply. In 1775, the total mount of currency in circulation (primarily gold and silver coins) was an estimated $12 million. In 1900, it was $1,954 million –an increase of 163X. During this time, the amount of gold in the world increased by about 3.4 times, due to mining production. Since gold does not deteriorate, all the 189,000 tones of gold mined over the centuries remains available for use as money. Maintaining neutrality in time and space, gold is neither inflationary nor deflationary (KEY POINT!) It penalized neither creditors nor debtors. It is a measuring stick and unit of account for the world’s goods and services. Satoshi, the “founder” of Bitcoin believed that his mining algorithm was mimicking gold. Bitcoin did laboriously cancel out the advance of technology through its ten-minute mining cycles and lottery process. Nakamoto invented digital scarcity….a digital good that is scarce and cannot be reproduced infinitely….a digital good whose transfer stops it from being owned by the sender.. The fatal flaw is the belief that the money supply can and should be determined by the supply of bitcoin or gold. Gold (or bitcoin mimicking gold) should serve not only as a measuring stick or unit of account but as the actual medium for all exchanges. Such monolithic money was also the ERROR of Murray Rothbard, an idiosyncratic exponent of Austrian theory who believed that any authentic gold standard must have 100 percent gold backing. He did not even believe in fractional reserve banking, intrinsic to the role of banks, which necessarily mediates between savers seeking safety and liquidity and entrepreneurs destroying it through long-term investments. The value of liquid savings is necessarily dependent on the achievements of illiquid and long-term enterprise. There is no way to avoid the maturity mismatch between savings and investments except by abolishing capitalism. 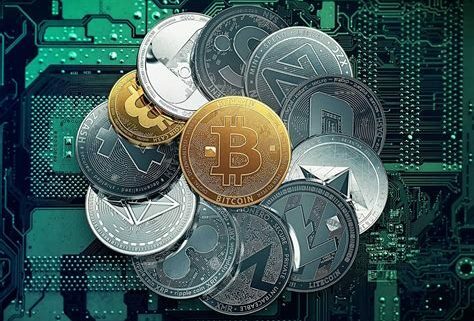 In the same way, bitcoin and other cryptocurrencies cannot become significant money without systems to intermediate between savers and investors. Money cannot be simply a smart contract. It entails continual acts of intelligent discretion in the provision of loans and investments responding to changes in markets and technologies. If the main source of Bitcoin’s volatility is volatile demand, we can expect the issue and circulation of bitcoin-redeemable liabilities to stabilize the demand for and therefore the value of Bitcoin by allowi9ng fluctuations to be borne by changes in the supply of liabilities rather than by the price level or the volume of transactions. A currency needs oracles to channel it to the most promising entrepreneurial uses. As Kendall explains, “While Satoshi was brilliant in creating the blockchain as the basis for bitcoin, Satoshi had no understanding of currency as a unit of account. 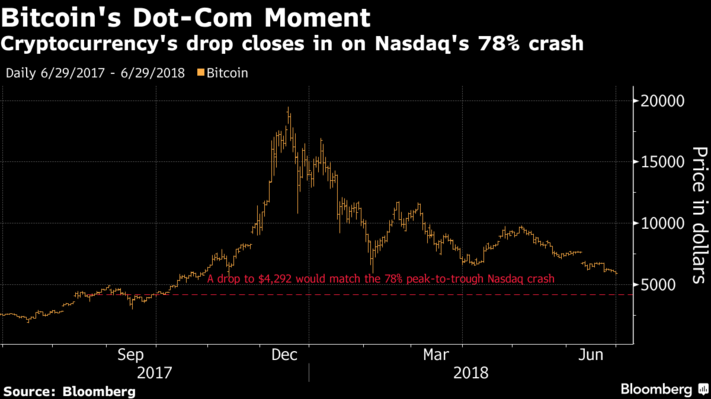 By limiting bitcoin’s supply to 21 million units over a 131-year period, Satoshi designed bitcoin as a deflationary currency….Because of its deflationary design, bitcoin is used more as a volatile investment bet: than as a MEASURING STICK or UNIT OF ACCOUNT. In other words, bitcoin’s fixed limit is deflationary and unworkable. Bitcoin is the transactions medium ITSELF rather than a stable metric for the valuation of fiat moneys. For gold, transactions are incidental; for bitcoin, transactions are the key point. Bitcoin, unlike gold, must therefore increase in either volume or value if the system is to succeed. Bitcoin, as now constituted, CANNOT BE A CURRENCY. Currencies create value by measuring it. The price of bitcoin changes with demand. You could respond that the price of the dollar also changes with demand. 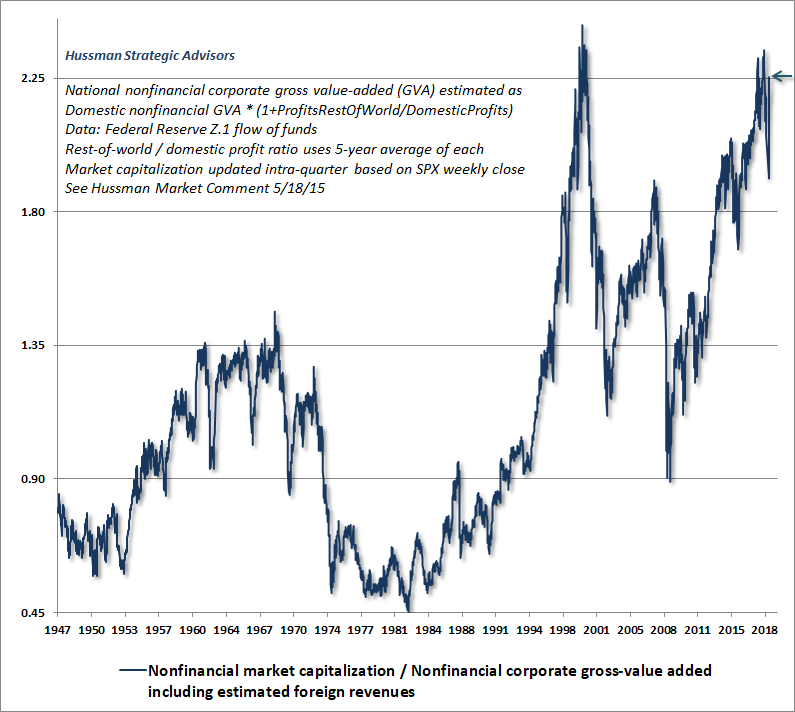 That has been mostly true since 1971, and such fluctuations are the Achilles heel of the dollar as a long-term currency. “No other basic unit of measure,” says Kendall–whether it is the second, the meter, the ampere, or the kilogram-“changes in value with demand. They are standards” based on physical constants. IF MONEY IS A MEASURING STICK, IT CANNOT RESPOND TO DEMAND. Since bitcoin cannot fulfill its basic role as a currency. its historical fate is to provide a haven from governments and central banks and a harbor for a great innovation, the blockchain. Source: Life After Google by George Gilder. $5,000 Gold Bandwagon Now Includes 85 Analysts! 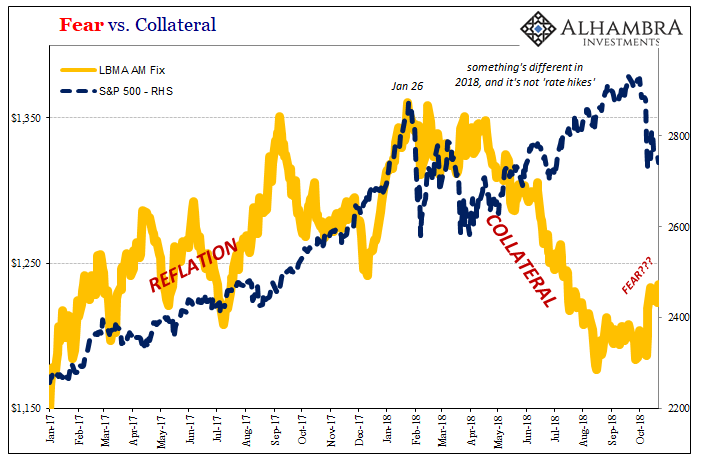 More and more economists, analysts and financial writers, 125 in fact, have taken the bold step of projecting the price at which gold will achieve its parabolic peak with 5 individuals claiming that the peak price will be realized sometime in 2011. Some have adjusted their previous prognostications higher given gold’s strong advance again in 2010 while others have jumped aboard what has become a bandwagon of optimism. The majority (85) maintain that $5,000 or more for gold is possible. There seems to be one name missing from the list. All those SWAGS have missed one important element. When you are talking about the price of gold, you are talking about two commodities, gold and whatever currency you are quoting the price in. If you can’t predict the value of the dollar in the future with accuracy, you cannot predict the price of gold either. You should buy gold when it is cheap and unloved. You should then sell it when it is expensive and everyone loves it. We have covered several times Warren Buffet’s pointed (and disingenuous) comment that gold has no utility. It just sits, and there is a cost for it to sit. And an opportunity cost. So why do people buy something which has no utility and no return? One, which we discuss a lot, is speculation. They buy whatever’s going up, in an attempt to cash in on the rise. So let’s not dwell on this. 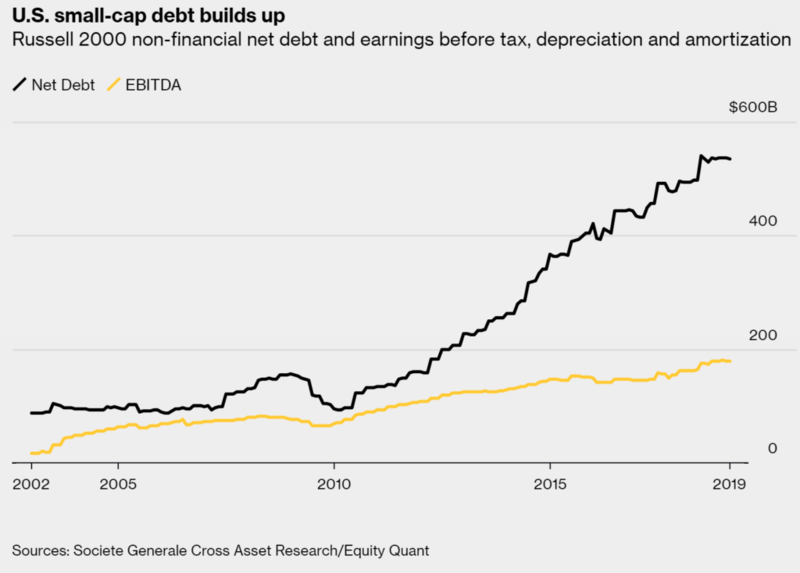 However, in addition to GE we know that a significant fraction of bonds out there are issued by so-called zombie corporations, whose profits are less than interest expense. Rising interest rates can only have increased the percentage, though the increased cost kicks in with a lag (as each bond matures and must roll). In addition to the problem of rising default risk from these companies, there is the risk if enough hits at once, that the credit market they depend on, goes no bid again as it did in 2008. Of course, if their bonds are impaired then their equities are worthless. Stocks will be crashing in this scenario. We raise the issue of price being set at the margin to make a point. In this scenario, the marginal buyer of gold will not be the speculator. It will be the mainstream investor who is desperate to protect himself from a financial system going mad again. When will this happen? Watch for news of GE and other major debtors sinking deeper into trouble. As to systemic default risk, i.e. 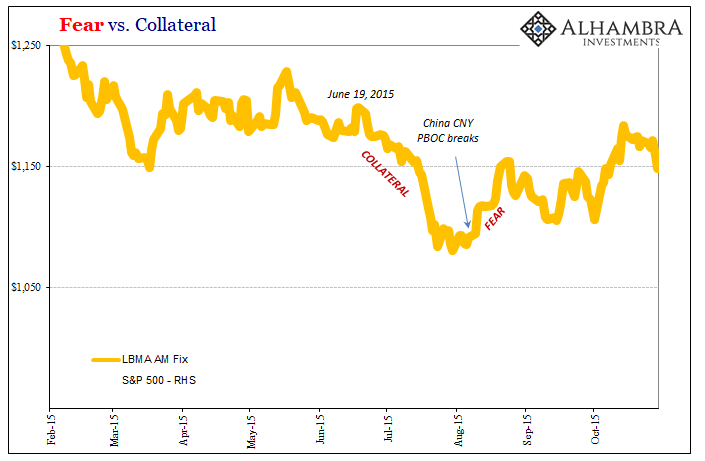 monetary collapse, it’s early yet. There are some peripheral currencies like the bolivar and lira that could go away soon. But their troubles are widely known, and visible far in advance. We would not expect their demise to have much impact on the world’s monetary order (though of course it is horrific for the people who live in Venezuela and Turkey). Other currencies are also in trouble—we have written a lot about the franc. It is impossible to predict the timing of such a thing, though our gut feeling is that it is still a ways out. So we end on a conclusion we have reiterated many times. When gold goes to $10,000 it is not gold going up. It is the dollar going down. It is inevitable that the dollar will go down. Keith just gave a talk at an Austrian economics conference in Madrid “There Is No Extinguisher of Debt” (paper to be published soon). The collapse of the dollar is baked into the mathematics. If you think they don’t understand, you are right. But the vast majority of voters support these politicians. The voters, too, don’t understand. And the investors too. Project Punch Card Investment Event December 7th in NYC–Hurry! 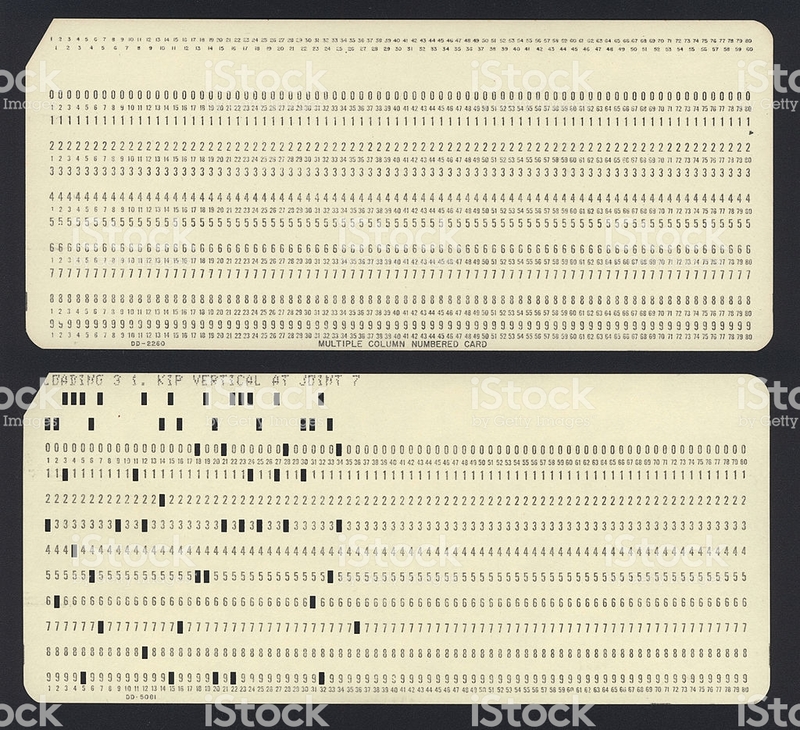 Old computer data entry punch cards. Our goal at Project Punch Card is to foster long-term investment orientation amongst students underrepresented in the investment research and management business. “We are delighted to announce that Alice Schroeder, the author of The Snowball: Warren Buffett and the Business of Life, the latest addition to the conference, will give a NEW keynote and share her insights on Mr. Buffett’s lesser-known investment secrets — built from thousands of hours spent with him and unique access to decades of Mr. Buffett’s archives. Buffett_Case Study on Investment Filters Tabulating Company as an example of her work. The Punch Card Conference has an incredible line-up of speakers and thought leaders including David Abrams (in a rare public appearance), John Rogers, Jonathan Levin, Murray Stahl and more. We expect a blend of Portfolio Managers, Investment Advisors, Analysts and Allocators (i.e pension funds, Endowments, insurance, FOF etc). Ideally we would like people from the target communities — women, people of color, or graduates of underprivileged colleges in the investment industry. Marketing and strategic partners such as Smart Women Securities, Forte Foundation and SEO may also be a material component of the audience composition. Breakfast, Full Sit-down Lunch, Coffee Breaks, and Networking Opportunities. When you go out in the world, look for the job you would take if you didn’t need the money. You really want to think about, what will make you feel good, when you get older, about your life, and you at least generally want to keep going in that direction. Don’t work for money . . . You’ll never be happy. You have to find the intersection of doing something you’re passionate about and at the same time something that is in the service of other people. I would argue that, if you don’t find that intersection, you’re not going to be very happy in life. I could improve your ultimate financial welfare by giving you a ticket with only twenty slots in it so that you had twenty punches–representing all the investments that you got to make in a lifetime. And once you’d punched through the card, you couldn’t make any more investments at all. Under those rules, you’d really think carefully about what you did and you’d be forced to load up on what you’d really thought about. So you would do so much better. This New York-based investor has value investing in his blood. His father, Irving, an arbitrageur, was instrumental in finding Max Heine his first job on the Street. Heine went on to run the legendary Mutual Shares Fund, and Irving Isaac sat on its board for three decades. And Paul Isaac’s uncle, Walter Schloss, a student of Benjamin Graham, was praised by Warren Buffett and profiled in Barron’s. At his former position leading a fund of funds, Paul Isaac produced high single-digit returns annually. That fund was sold after the 2008-2009 financial crisis. He continues to manage Arbiter, a hedge fund that has returned 21%.. I have no association with the organizers of this event. I may be given a free ticket. However, I may not be able to attend. I hope to change my schedule to attend because just being able to meet Murray Stahl would be worth it for me.